Unless you look like the vast majority of Republicans in the Texas Legislature — an older, wealthy-ish, white man — you were screwed over this session. They’ve gone after immigrants, people of color, women, LGBTQ Texans, vulernable kids, non-Christians — and everyone at the intersections of these targeted identities — with backwards policies aimed at feeding their base of primary voters. Because we live under single-party rule in Texas, the GOP’s twisted priorities are on their way to (or already have) become the law by landing on Governor Greg Abbott’s desk. The buck, so to speak, stops with him and his veto power — and, maybe more disturbingly, his ability to call a special session to give extremists like Lt. Gov. Dan Patrick more opportunities to trample on the rights and lives of Texans. 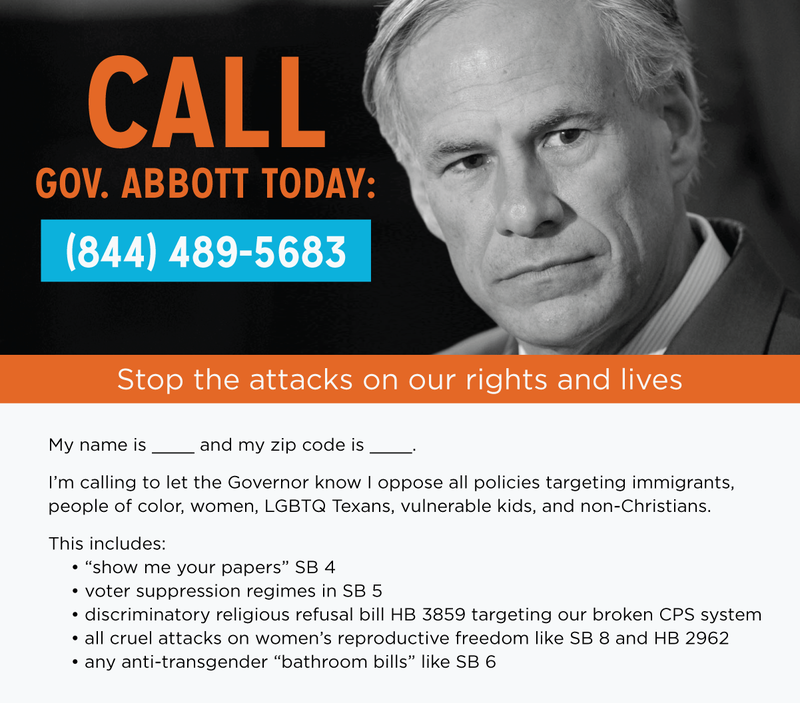 Just today, Abbott said passing Patrick’s grossly discriminatory so-called “bathroom bill” was still a priority. With regular session wrapping up on Monday, May 29th, we need to start calling Gov. Abbott TODAY.